On April 17, 2012, Palestinian Prisoners’ Day, people around the world will respond to the call to take action for Palestinian political prisoners. The courage of hunger striking prisoners Khader Adnan and Hana Shalabi drew the attention of the world as they protested their confinement in administrative detention – imprisonment without charge or trial – by the Israeli occupation. 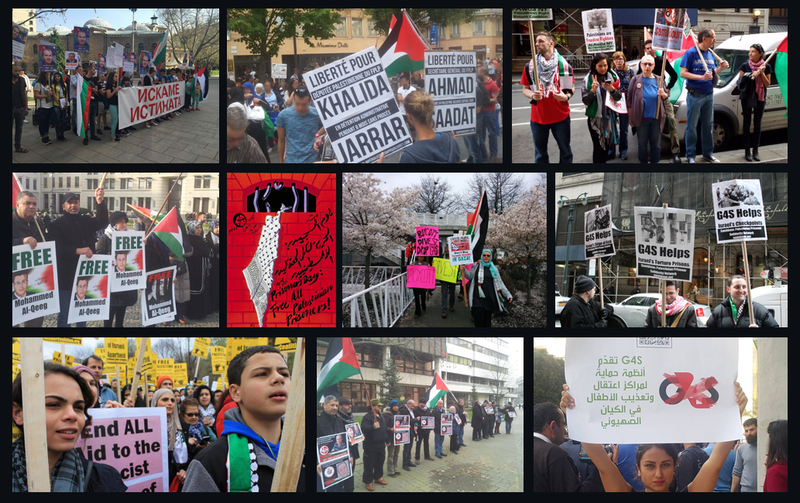 In Vancouver, Join us on April 17 to support Palestinian prisoners, demand their freedom, and call for justice. 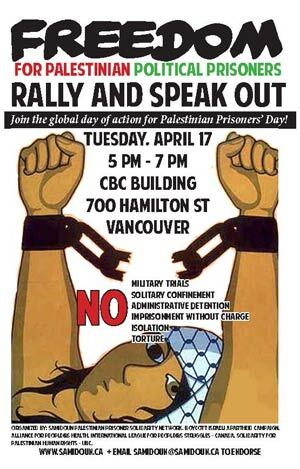 Rally and Speak-Out for Palestinian Prisoners; Tuesday, April 17, 2012, 5 PM – 7 PM, CBC Building, 700 Hamilton St (Hamilton and Georgia), Vancouver. Arresting and targeting vulnerable groups including children, people with disabilities, elderly people and ill people. Here in Canada, the Canadian government is deeply complicit and directly implicated in the ongoing occupation of Palestine and the crimes of the Israeli state – as well as responsible for political imprisonment and repression in indigenous communities, against migrants, refugees and other targeted communities. The voices of Palestinian political prisoners remain silenced and unheard. Indeed, Jason Kenney’s Ministry of Citizenship and Immigration defunded Palestine House’s immigrant settlement programs in part because it held an event celebrating the release of Palestinian prisoners, in a clearly politically-motivated action. When the voices of Palestinian prisoners manage to break through on Radio-Canada (French-language CBC), they face immediate attack from Zionist groups and even rebukes from within the station while Palestinian prisoners’ struggles rarely make it at all to the English-language CBC airwaves. Palestinian prisoners are on the front lines of the Palestinian struggle for liberation on a daily basis. In the jails of occupation, Palestinian prisoners confront the oppressor and the occupier, and put their bodies and lives on the line to continue their people’s struggle to achieve justice and freedom for the land and people of Palestine. The Israeli occupation has criminalized all forms of Palestinian existence and Palestinian resistance – from peaceful mass demonstrations to armed struggle to simply refusing to be silent and invisible as a Palestinian. Palestinian prisoners are men and women – and children – from every part of Palestine, from every family. Their absence is keenly felt in the homes, communities, villages, towns, labour, women’s and student organizations from which they were taken by the occupation. They suffer torture, isolation, coercive interrogation, denial of family and lawyers’ visits, on a daily basis. And it is their hunger strikes, their calls to the world, their unity and solidarity, and their continued leadership in the Palestinian movement that must inspire us daily and remind us of our responsibility to take action. Join us on April 17, Palestinian Prisoners’ Day, to be part of the global movement for justice and freedom for Palestinian prisoners.